DMC We are pleased to offer a wide selection of DMC fibers. 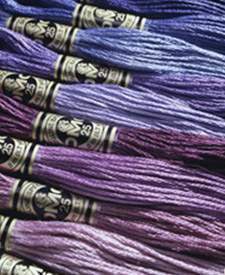 The complete collection of DMC cotton floss is available, as is the metallic floss, Rayon floss, Perle Cottons, and more. 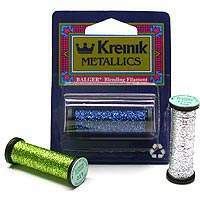 Kreinik We carry a wide variety of the Kreinik metallic threads, including blending filament, #4 very fine braid, #8 fine braid, some #12 and 16 braids, Japan threads, Ombre, and more. 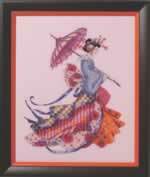 We also have a limited selection of Silk Mori and Milkpaints in stock, although we are able to get them all. Caron Collection You will love these gorgeous hand-dyed fibers. We carry the complete collection of Watercolors variegated three-ply pima cotton, Wildflowers variegated single strand cotton , Waterliles vareigated twelve-ply silk, Snow opalescent synthetic, and a small selection of the Soie Cristale solid color silks - but we are able to special order anything you desire. Crescent Colors We carry a all of the Crescent Colors cottons and silks, Hand Dyed Cotton Floss, and Hand-Dyed Belle Soie Silk, We are able to special order any of the perle cottons that you need, but we do not have those in stock. 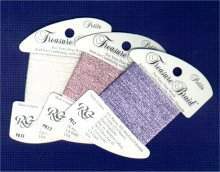 Rainbow Galleries We carry a several of the Rainbow Gallery threads, including the Petite Treasure Braid, Splendor Silk, Wisper, and others, including some Bravo, UltraSuede, Gold Rush XS, Alpaca, Nordic Gold, and Santa's Beard. We are able to special order most that we do not have in stock. 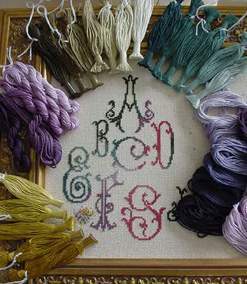 Needlepaints From Lavender & Lace. We carry all of these lovely hand-dyed Egyptian Cotton threads. Glissen Gloss All of the Glissen Gloss threads, including the Colorwash silks, Estaz, and Rainbow Metallics. 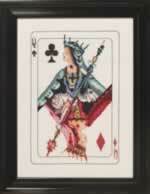 We are able to special order any for you if you cannot find them on our site.